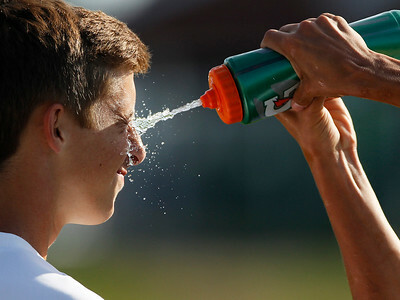 Matthew Apgar - mapgar@shawmedia.com McHenry's Zach Ruppenthal, left, gets squited in the face with a water bottle squeezed by teammate Ian Tapia, right, before their boys soccer game against Cary-Grove on Wednesday, Sep 23, 2015 at McHenry High School West in McHenry. McHenry won the game 1-0 on a goal by James Mulhall. 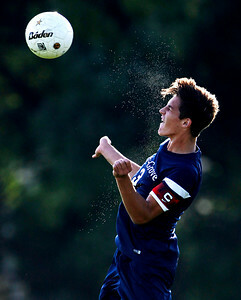 Matthew Apgar - mapgar@shawmedia.com Sweat flies off of Cary-Grove's Michael Arenberg after connecting with a header during their boys soccer game against McHenry on Wednesday, Sep 23, 2015 at McHenry High School West in McHenry. McHenry won the game 1-0 on a goal by James Mulhall. 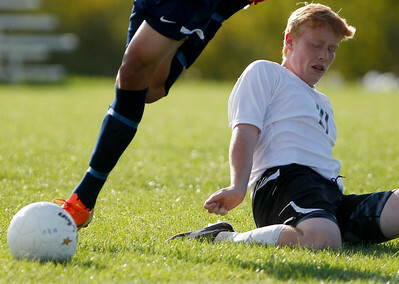 Matthew Apgar - mapgar@shawmedia.com McHenry West takes on Cary-Grove during their boys soccer game on Wednesday, Sep 23, 2015 at McHenry High School West in McHenry. McHenry won the game 1-0 on a goal by James Mulhall. 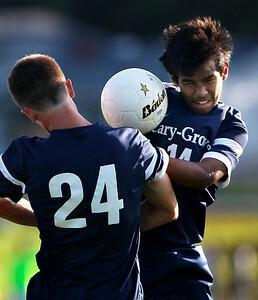 Matthew Apgar - mapgar@shawmedia.com Maxwell Green, left, and Oscar Silis of Cary-Grove collide as they vie for the header during their boys soccer game against McHenry on Wednesday, Sep 23, 2015 at McHenry High School West in McHenry. McHenry won the game 1-0 on a goal by James Mulhall. 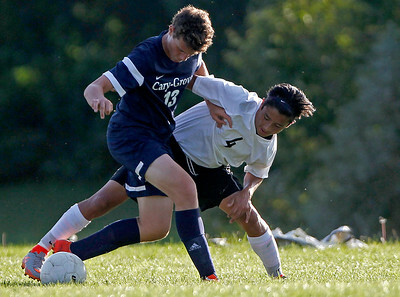 Matthew Apgar - mapgar@shawmedia.com Josh Burr of McHenry, back, collides with Oscar Silis of Cary-Grove as they battle over the ball during their boys soccer game on Wednesday, Sep 23, 2015 at McHenry High School West in McHenry. McHenry won the game 1-0 on a goal by James Mulhall. Matthew Apgar - mapgar@shawmedia.com McHenry's Zach Ruppenthal, left, collides with Michael Arenberg of Cary-Grove as they jump up for the header during their boys soccer game on Wednesday, Sep 23, 2015 at McHenry High School West in McHenry. McHenry won the game 1-0 on a goal by James Mulhall. Matthew Apgar - mapgar@shawmedia.com McHenry's Ian Tapia, right, and Tomas Kvapil of Cary-Grove get intertwined during their boys soccer game on Wednesday, Sep 23, 2015 at McHenry High School West in McHenry. McHenry won the game 1-0 on a goal by James Mulhall. Matthew Apgar - mapgar@shawmedia.com McHenry's Ian Tapia, back left, and Luis Beltran, back right, congratulate James Mulhall, back center, after scoring the only goal against Cary-Grove during their boys soccer game on Wednesday, Sep 23, 2015 at McHenry High School West in McHenry. McHenry won the game 1-0. 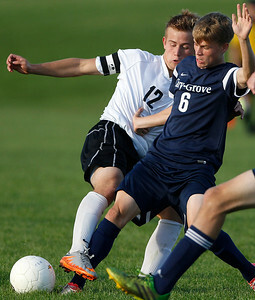 Matthew Apgar - mapgar@shawmedia.com McHenry's James Mulhall, left, battles for the ball with Zavier Nevoraski of Cary-Grove during their boys soccer game on Wednesday, Sep 23, 2015 at McHenry High School West in McHenry. McHenry won the game 1-0 on a goal by James Mulhall. 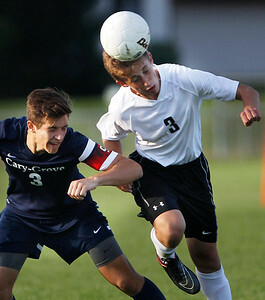 Matthew Apgar - mapgar@shawmedia.com McHenry's Zach Ruppenthal, right, connects with the header in front of Michael Arenberg of Cary-Grove during their boys soccer game on Wednesday, Sep 23, 2015 at McHenry High School West in McHenry. McHenry won the game 1-0 on a goal by James Mulhall. 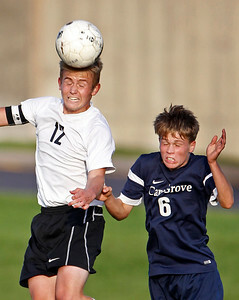 Matthew Apgar - mapgar@shawmedia.com McHenry's James Mulhall, left, connects with the ball, beating out Zavier Nevoraski of Cary-Grove for the header during their boys soccer game on Wednesday, Sep 23, 2015 at McHenry High School West in McHenry. McHenry won the game 1-0 on a goal by James Mulhall. Matthew Apgar - mapgar@shawmedia.com McHenry's James Mulhall finds a way through Luis Lemus, left, and Brett Schuerg of Cary-Grove during their boys soccer game on Wednesday, Sep 23, 2015 at McHenry High School West in McHenry. McHenry won the game 1-0 on a goal by James Mulhall. 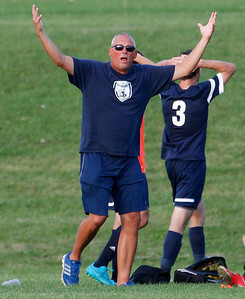 Matthew Apgar - mapgar@shawmedia.com Cary-Grove head varsity coach Mark Olson reacts to referees after captain Michael Arenberg, back, is removed from their boys soccer game against McHenry on Wednesday, Sep 23, 2015 at McHenry High School West in McHenry. McHenry won the game 1-0 on a goal by James Mulhall. 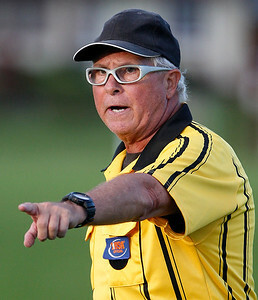 Matthew Apgar - mapgar@shawmedia.com A referee warns fans about unsportsmanlike behavior during the boys soccer game between McHenry and Cary-Grove on Wednesday, Sep 23, 2015 at McHenry High School West in McHenry. McHenry won the game 1-0 on a goal by James Mulhall. 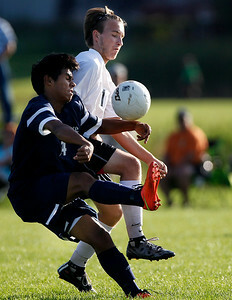 Josh Burr of McHenry, back, collides with Oscar Silis of Cary-Grove as they battle over the ball during their boys soccer game on Wednesday, Sep 23, 2015 at McHenry High School West in McHenry. McHenry won the game 1-0 on a goal by James Mulhall.